Angeline Baez, a third grade student at Our Lady of Lourdes School in Harlem has grown up speaking both English and Spanish, like many of her classmates. This year, however, Baez is introducing words in a new language to her already bilingual family. These new words are in Italian and they include colors, numbers, animals, and other everyday words. Italian words are not often heard around the neighborhood, if at all, and the Baez family is excited to have their young daughter as their teacher. Curti, originally from Parma, Italy, also lived in Barcelona for two years. Understanding and speaking Spanish has become a positive asset for the students, as many are from Spanish-speaking households. She understands the similarities and differences in pronunciation and is able to explain these contrasts to her students. On March 2, the students at Our Lady of Lourdes were able to show off their new language skills and thank IACE for this opportunity. Perhaps, the most vivid representation of the student’s gratitude was found in their impressive progress and their execution of the language. 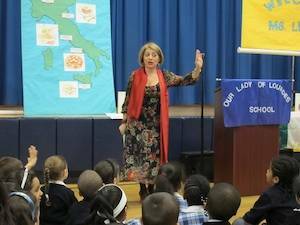 The students sang two songs in Italian with crisp pronunciation and expressive gesticulations. They raised their hands and asked questions in Italian and used proper sentence construction and inflection. Despite the presence of several special guests, the students remained poised and attentive to the language rules they learned in class. 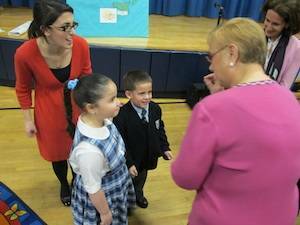 Throughout the duration of the ceremony, “Nonna Lidia” Bastianich answered questions that the students prepared for her about Italian culture, food and family. 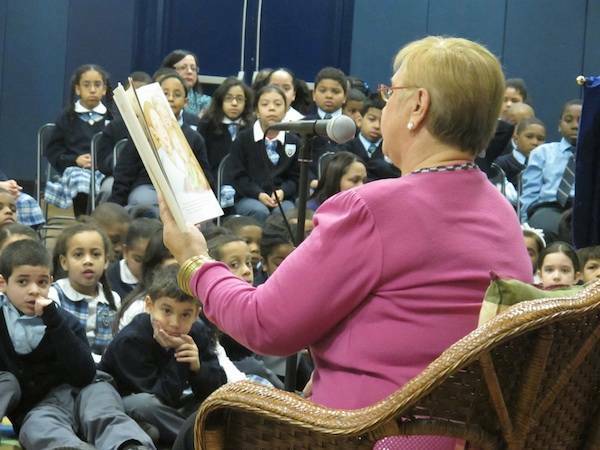 She shared stories about the traditions she shares with her five grandchildren. 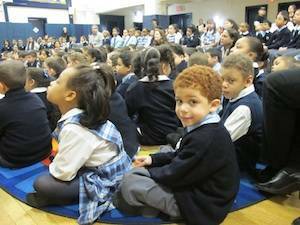 The children watched Nonna Lidia with wide-eyes and remained entertained throughout the ceremony. The room erupted with laughter when Bastianich shared humorous anecdotes from her childhood. When she was a little girl, learning to cook with her Nonna, she and her siblings used to replace the wrapped candies in the house, “le caramelle,” with pebbles. The students loved this new idea to sneak sweets from around the house. “We are taking things to the next level here, and crossing cultural boundaries.” Hufnagel also promises that she will continue to pray and do everything in her power to renew the grant for continued Italian language courses for the future. Although the uplifting ceremony came to an end for the students' lunchtime, the discussion for renewing the grant to Our Lady of Lourdes will continue in upcoming months. School administrators hope to continue the language classes, made possible by generous service from IACE.